At CES, Dell has launched a new convertible laptop, designed for small businesses in terms of features and a wallet-friendly starting price. The Latitude 13 3000 Series 2-in-1 comes with a 13.3-inch full HD (1920 x 1080) touchscreen display and offers a brushed aluminium finish. The notebook has a 360-degree hinge, meaning the keyboard section can be rotated around until it's flat against the display, so you can use the device as a tablet (it automatically switches into tablet mode). As well as this tablet mode, and the normal laptop configuration, you can use the Latitude 13 in 'stand' (as pictured above) or 'tent' modes for the likes of giving presentations. As for the processor, there's a choice of Skylake flavours, with a Pentium CPU in the base model, and then Core i3 and i5 processors as you step up the range. Memory on the base model is 4GB with storage provided by a 128GB M.2 SSD, and that doubles up as you move up through the range – 8GB/256GB for the middle model, and 16GB/512GB for the top-end laptop. All of the machines run Windows 10 Pro and are 18.7mm at their thinnest point, with a starting weight of 1.75kg. Battery life is quoted at up to 8 hours. In terms of ports, you get a USB Type-C port on board, along with a USB 3.0 and USB 2.0 connector, plus an HDMI v1.4a port and a microSD card reader. There's also a Noble lock security slot. Finally, for added security, the laptop comes with an infrared webcam that supports Windows Hello out of the box. The warranty is for one year hardware service, with "onsite/in-home service after remote diagnosis". 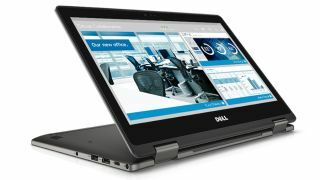 The Dell Latitude 13 3000 is out now over in the US, and you can pick one up starting at $699 (around £530, AU$930).